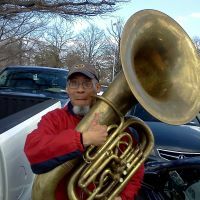 Some great tuba playing, clip can be heard here. https://youtu.be/mr097Hy3YsI. Gene won Chicago in 1989, I don’t think Mike Sanders had been offered the position when this was recorded. Can anyone identify the tubist? Mike is on Facebook if you want to ask him there. Done. If I get an answer, I will reply. Phil Sinder played on several of the recordings with St. Louis between Pokorny and Sanders. I think he may have been on that one.